When I was in Nice a few weeks ago, I had the most wonderful Boeuf en Daube one evening at Lou Pistou. I’d been looking for typically Niçoise food to eat while I was there and a daube captures much of the essence of Provençal cooking. 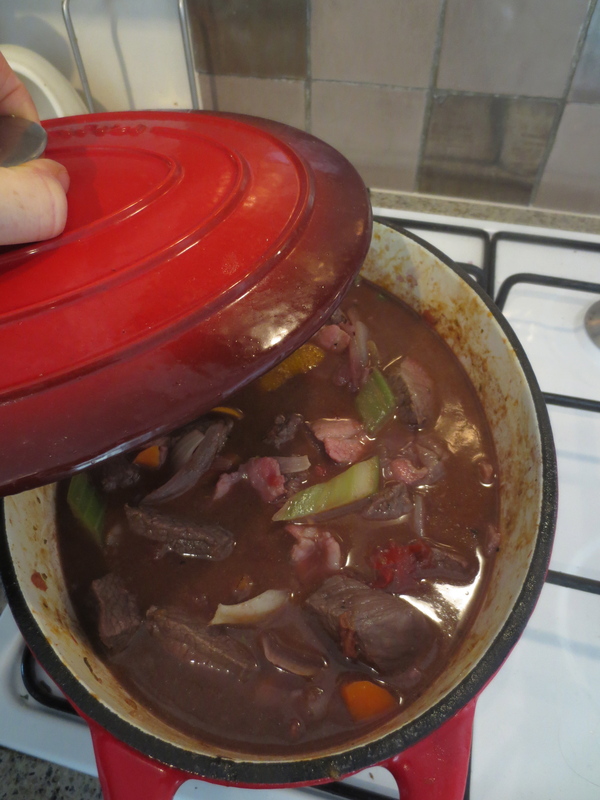 When I ordered it, I wondered what made this beef stew different to a Boeuf Bourguignon, which is a great favourite of mine and something I cook a lot during the winter and for entertaining. I was in Nice in September and the temperature was in the late 20s, so I did wonder, was a daube really the right thing to order? I’m so glad I did for what I noticed immediately was the greater freshness of a daube with its use of fresh tomatoes and the fragrant addition of orange. Some recipes suggest the addition of olives too, which makes it especially ‘Provençal’, but that seems to be optional. I added some but if you don’t like olives, leave them out, because olives have a strong and distinct flavour. 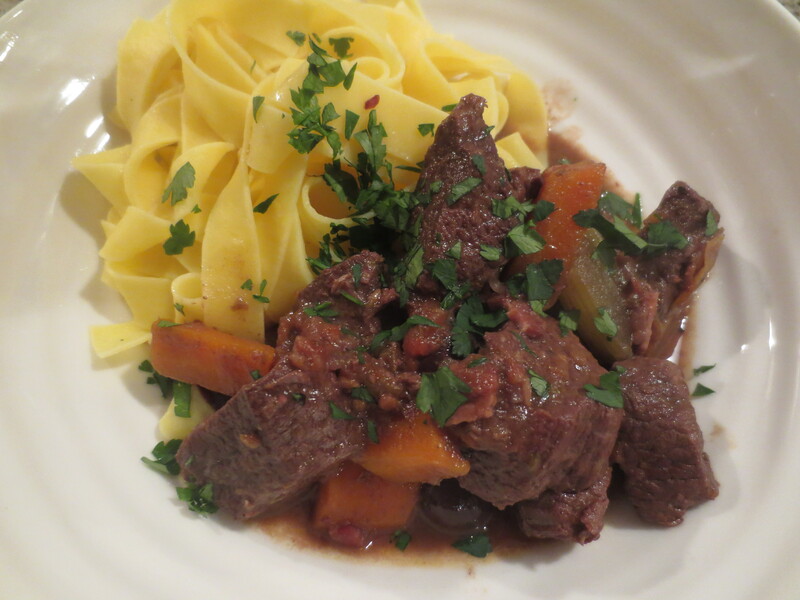 Essentially, a daube is a rustic dish and thus there are no exact proportions. It’s basically a beef stew that is cooked very, very slowly, with the addition of red wine, vegetables and that special addition of orange and maybe some black olives. I used a lean braising steak but it would work very well with a much cheaper cut, just cook it for however long it takes to get tender. I think it’s also a dish that is much better prepared in advance than eaten straight away. I made mine on Friday for Sunday’s meal and this gave time for the flavours to develop and it’s all the more delicious for the wait. Nice was part of Italy until 1860 and I noticed the strong influence of Italian cooking on the food there and this was particularly evident in the way they served pasta – noodles – with meat dishes rather than potatoes or rice. The daube I had at Lou Pistou came with noodles and so I decided to serve mine with pasta too and just a plain green salad on the side. 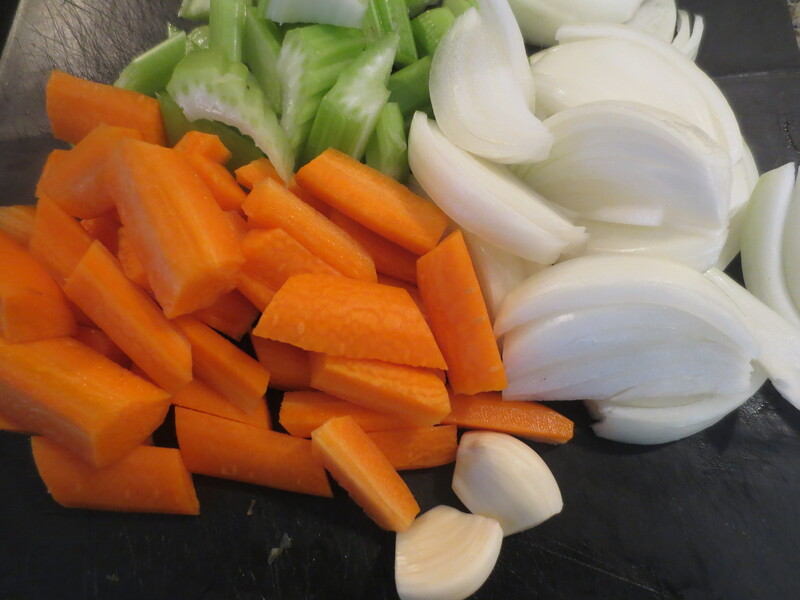 The first thing to do is chop 2 carrots, 1 large onion, 2 cloves garlic, 1 stick celery. 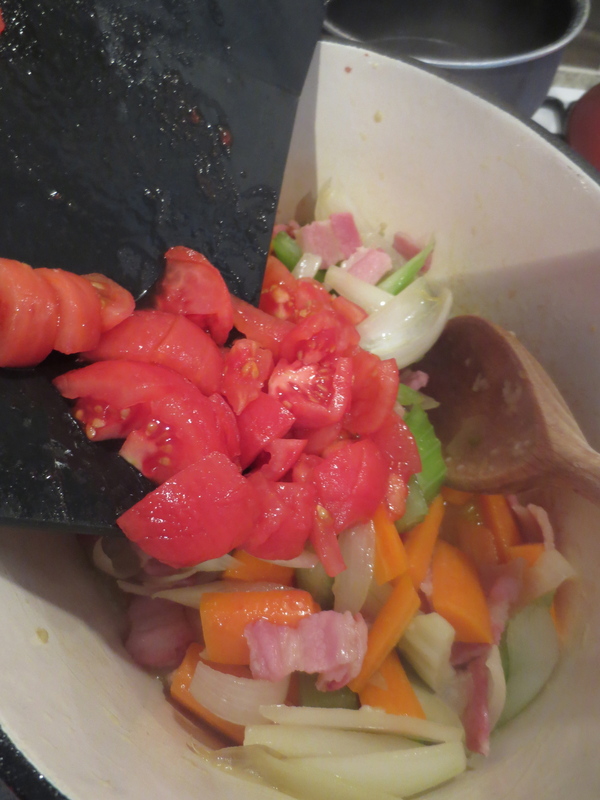 I decided to cut mine in fairly large chunks, which seemed more in keeping with the dish’s rustic background than finely chopped vegetables. I also love eating the vegetables when cooked in that way so you get distinct chunks of carrot and onion. Also chop about 100g streaky bacon into slices (or you could use lardons, if you want to be more French!). 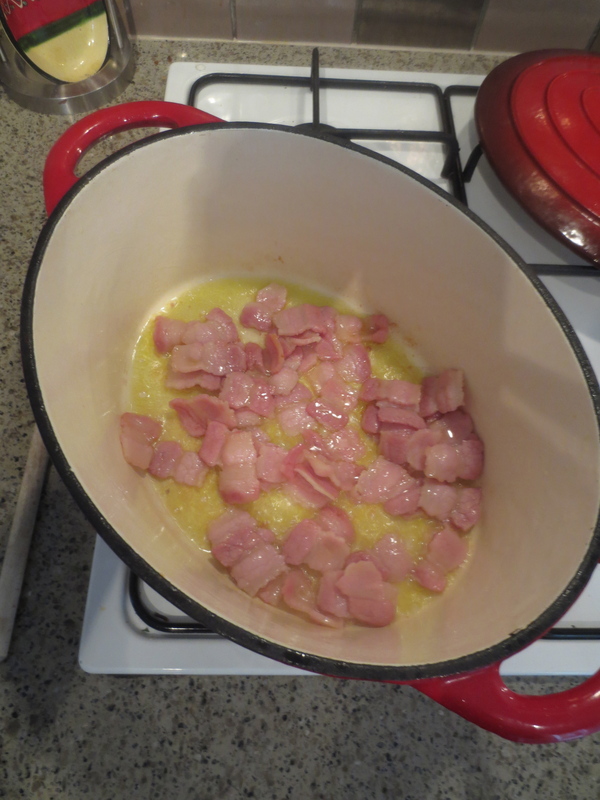 Now, pour about 2 tablespoons olive oil in a large ovenproof pot and add the bacon first. Once this has coloured, tip in the chopped vegetables. Cook the vegetables gently until colouring but don’t brown too much. Meanwhile skin and chop 4 medium tomatoes by making a shallow cross on the bottom of each with a sharp knife and then standing in boiling water for about a minute. Drain and then the skin should peel off easily. 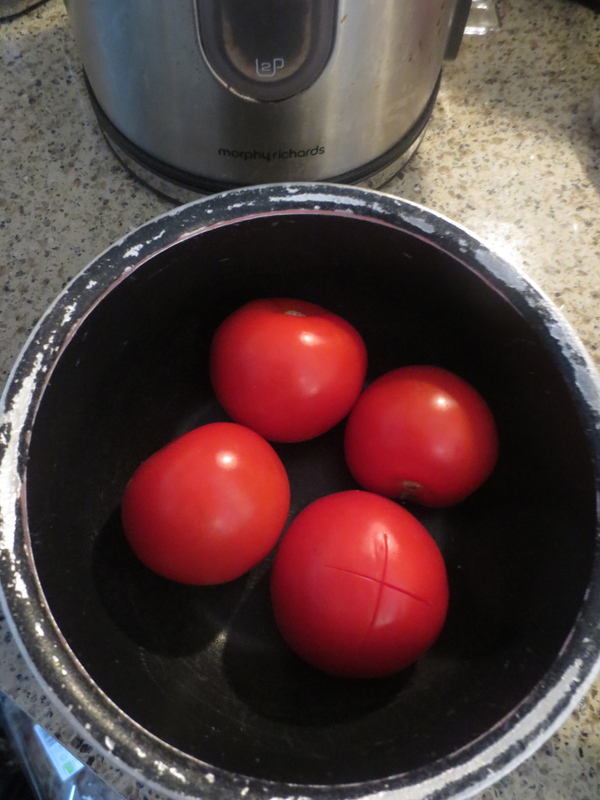 When the vegetables in the pot have started to colour, add the tomatoes. 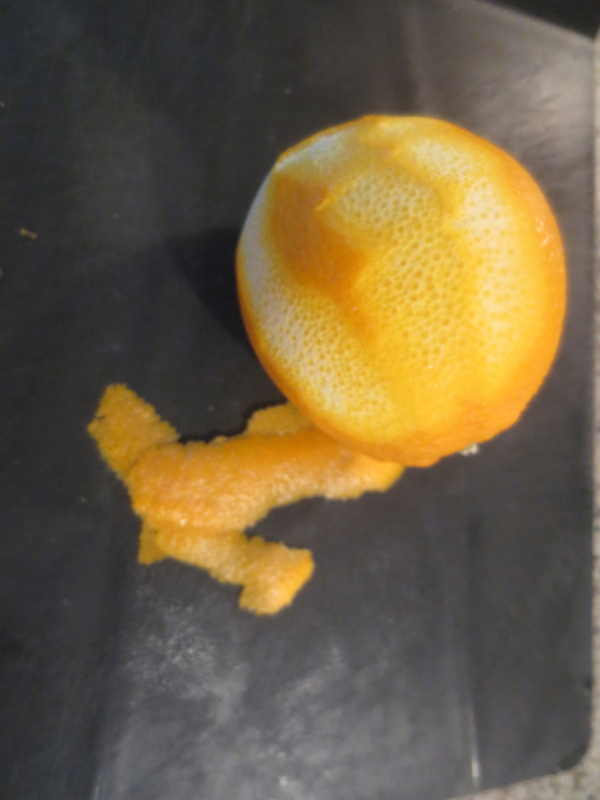 Use a vegetable peeler to cut of 3 strips of peel from an orange. 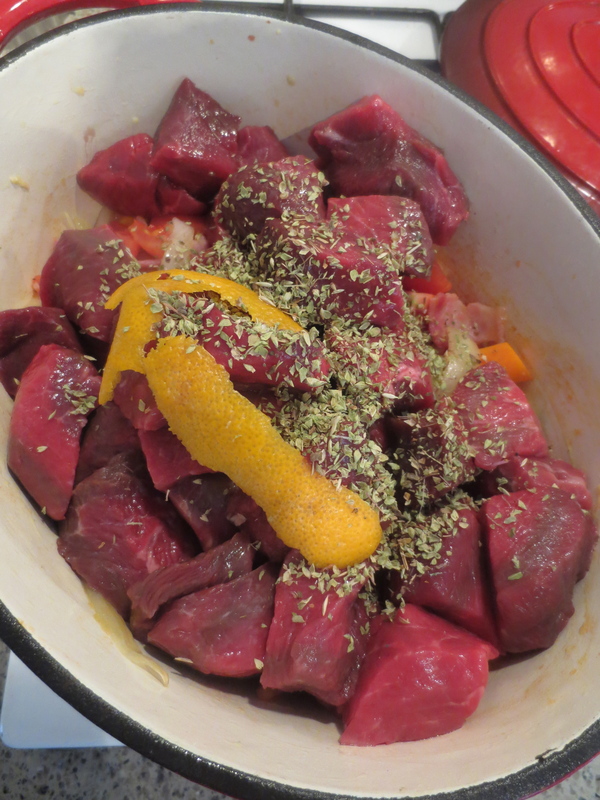 Now add 1kg beef – chopped into bite-sized pieces (or traditionally large pieces) – to the vegetables and the orange peel. Sprinkle over a teaspoon of Herbes de Provence. 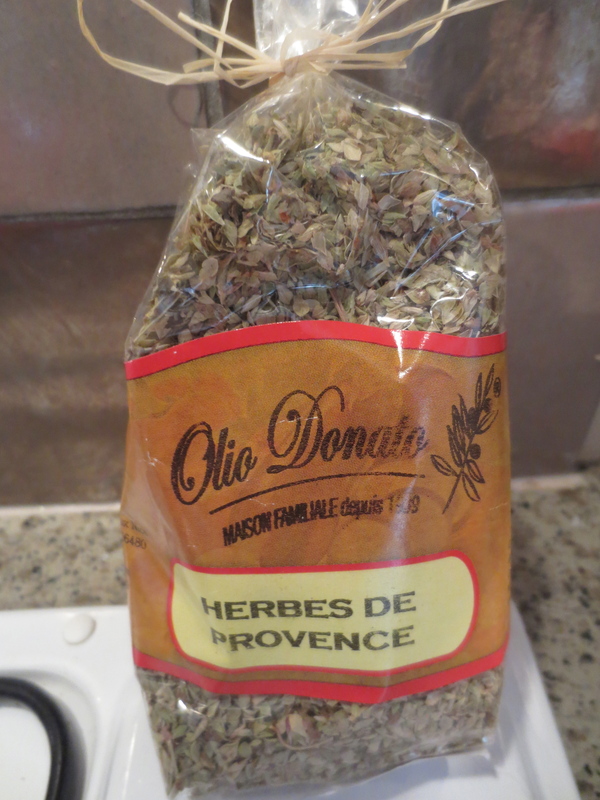 Tradtionally herbs like thyme, parsley and bay leaf are used but I wanted to use of the dried herbs I brought back from Nice. Also add some seasoning of salt and pepper. Cook the meat and vegetables for about 10 minutes until the meat starts to colour but doesn’t brown. 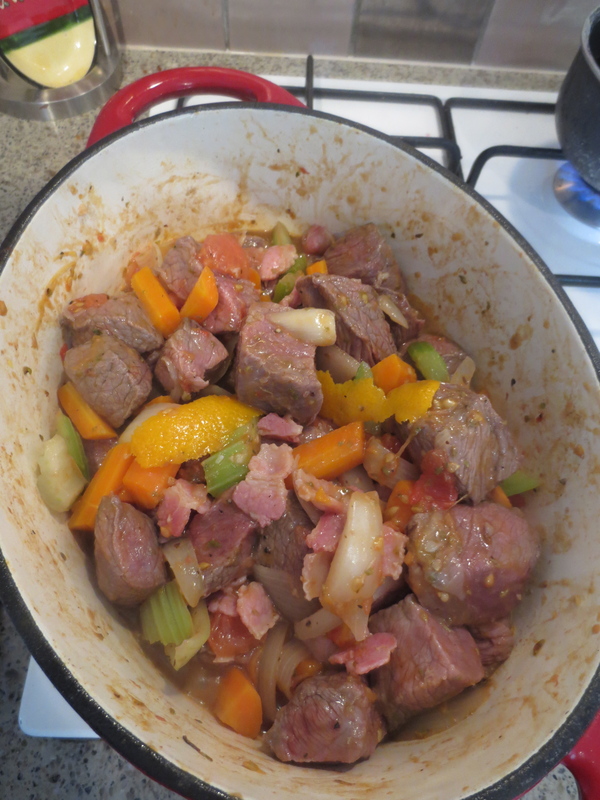 This also seemed an essential difference to the daube rather than other beef stews where the meat is browned well to caramelise and give a deeper flavour. The lack of caramelisation was, I thought, part of what kept the dish light and fresher. Open a bottle of red wine – French if you can! 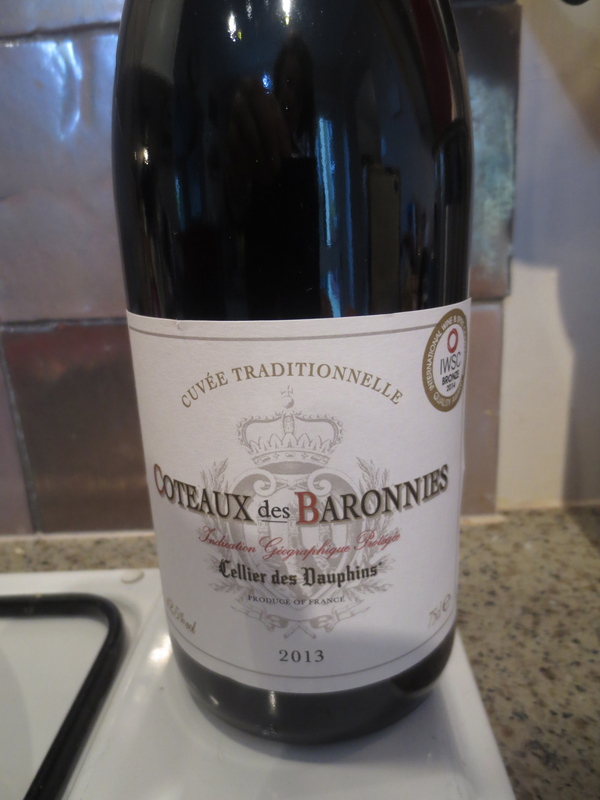 I bought a bottle of Cote de Rhone on offer in Waitrose for £5.99.You want a reasonable bottle but obviously not a really expensive one. Too cheap, and your stew will taste vinegary. 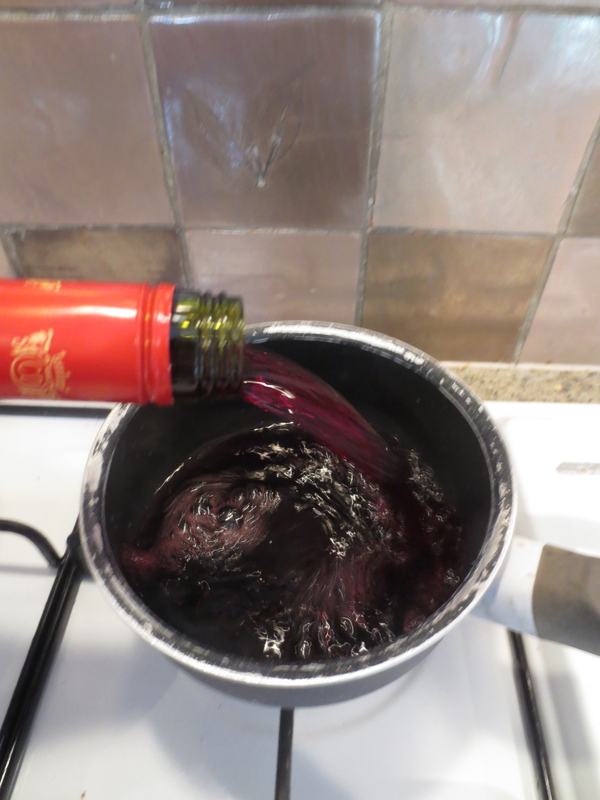 Tip about two-thirds of the bottle of wine into a pan and bring to the boil; boil for a couple of minutes to reduce a bit. Then add to the meat and vegetables. Bring to a simmer then put a lid on and transfer to the oven at a low heat (Gas 2/150C/Fan 130) and cook for 3-4 hours, depending on your cut of meat, until the meat is tender. About halfway through the cooking time add some black olives (about a heaped tablespoon) if you’re planning to use them. I couldn’t find small Niçoise black olives – I don’t think I’ve ever seen them here – but used some small Spanish ones which had also been stoned – that seemed a good idea. 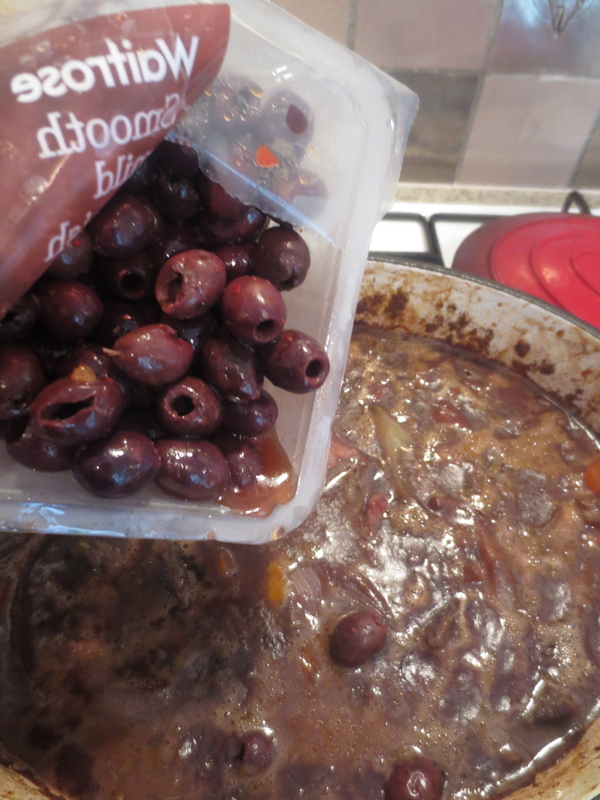 It’s not nice to eat a stew with little olives that haven’t been stoned. 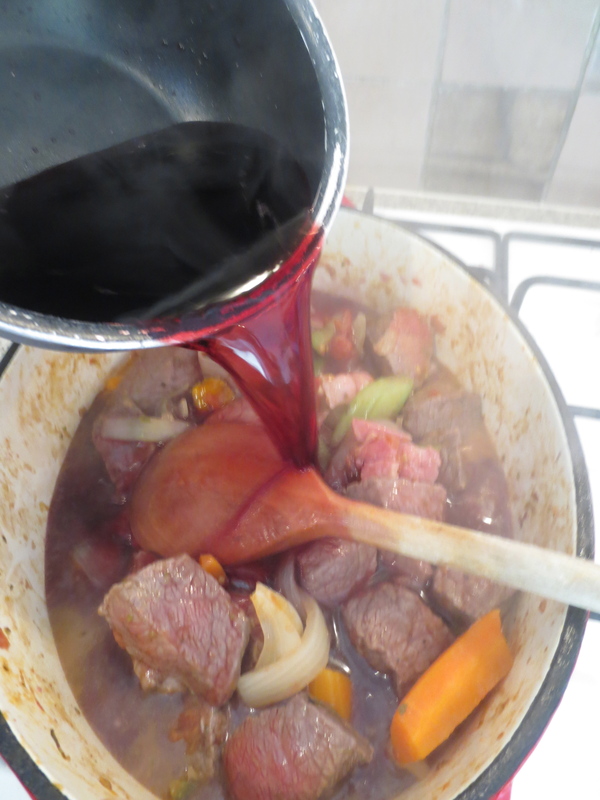 I think the daube really benefited from 2 days in my fridge. This evening I gently reheated – it didn’t need anymore cooking – and served, as I said above, with some noodles and green salad. At the last moment I sprinkled over some fresh chopped parsley. It was a lovely dish bringing back happy memories of Nice and a really delicious meal I had there. 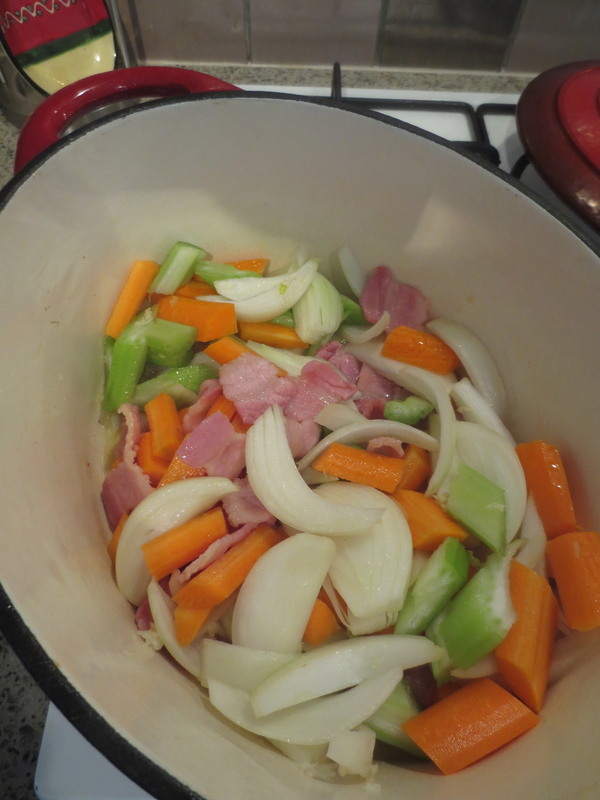 I’d made a big pot – enough for me, Jonathan and Lyndsey – and also a couple of portions to freeze for another evening. I also think it’s an ideal dish for entertaining as we go into winter because it’s so good made in advance and needs very little attention when it comes to dinnertime. Sounds like a delicious reminder of Nice. Olives or no olives, which is your preference? Thank you, Karen. I love olives so added them but you don’t want to overdo it as their flavour is strong. This is a lovely, great dish! I’m not sure about the olives but I’ll sure make it. It sounds wonderful! This looks so wonderful! I am fascinated by the orange. I was just in Nice and all of the olives were so spectacular. Did you ever taste picholines?